This comic was tagged alien, cartoon, comic, friend, funny, girlfriend, monster, space, webcomic. Hi, I run a blog (woaba.blogspot.com) where I feature cool movies, books, comics, etc, which deserve a bigger audience. I’m currently planning a blog post rounding up a few webcomics which I like, and would like to feature your blog. I love the surreal humour of this comic strip, so would it be okay to include it in my webcomic round-up? I’d obviously also include a link to your blog, along with a brief description, and also your twitter and pinterest details. I understand if you’d prefer to keep your comic strips exclusively available on your blog, but if you’d be okay with me featuring this comic strip then let me know. Thanks. I’d be more than happy for you to feature it, I’m glad that you like it. Thanks, I’ll post a link to my round-up when I publish it in a few weeks time. Just a quick update. 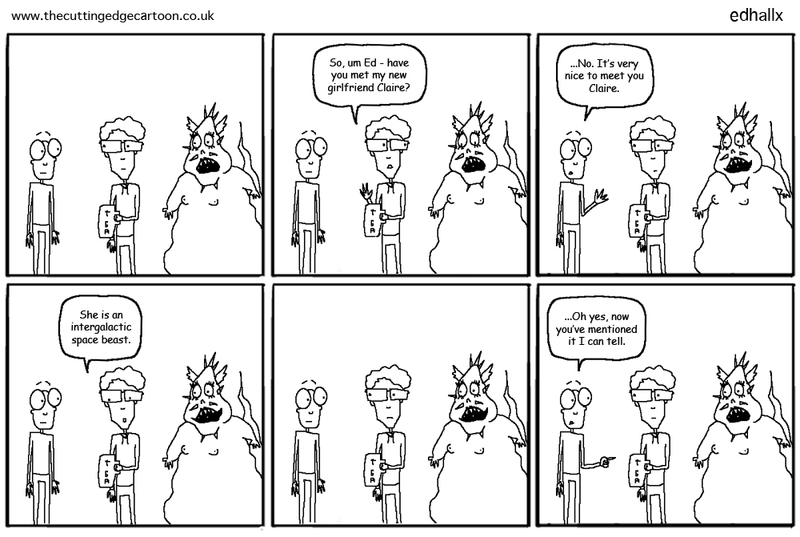 This is the link to my blog post on webcomics. Thanks again for letting me feature your comic strip.